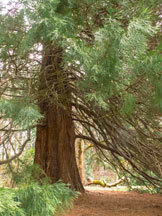 Here in Pier Park there is a significant grouping of 29 giant sequoias and one coastal redwood located upon a knoll at the north end of the park. Giant sequoias are the world’s largest single trees by volume and given the right environment, they are known for their longevity, living up to 3,000 years. These sequoias are infants, being planted 60 years ago. From a distance you can see the gigantic pyramidal shaped trees. Crossing over the bridge from Chimney Park, bikers and walkers will be greeted by these gentle giants. From the bridge, the path winds through this grove of sequoias. 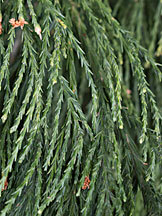 Though sequoias trees themselves are large and strong, they have feeder roots that are fragile, tender and shallow. Because the health of the giant sequoias depend on these roots for hydration, it is important to take care when treading in the grove. The bark of the sequoia, which can grow to an impressive 3 feet in thickness, is fibrous and absorbs moisture somewhat like a sponge for the tree. This blanket of bark helps to protect these trees from lightening strikes and fire. A sequoia is not only a tree but a unique ecosystem unto itself providing food and shelter to insects such as beetles and butterflies as well as robins and chipmunks, squirrels and bats. Pause. Admire the height and girth of the trees. 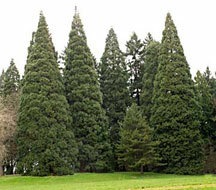 Pier Park is blessed to have this grove of giant sequoias within its family of trees. The National Park Service provides a wonderfully detailed description and history of the giant sequoia.